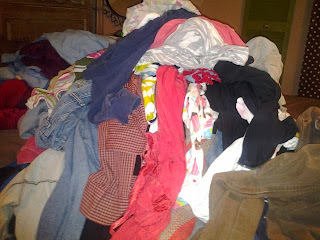 My blog is like my laundry pile, because I keep putting them both off and it just makes the job harder! I conquered this pile while I watched The Voice last night. And I did 3 more loads this afternoon. Luckily, my mom was over today, and she tackled the laundry pile in Katie's room! I'm already in the Christmas spirit, so it seems like Halloween was a loooong time ago. BUT it has to get documented! Katie had a costume parade at school. She and her friend, Harper, were both Minnie Mouse. Harper's costume was her mom's when she was little. Katie had my mom, Marcus and me cheering her on at the parade! Katie thought we were supposed to bring our big treat bucket to the neighbor's house to give them candy. She was THRILLED when she realized they were giving her candy! She said, "Let's do that again!" You can see our new baby in that round belly! I took Katie to a few houses, then Marcus had a turn while I passed out candy. Then we ditched our house and went to see Katie's cousins. They did some more trick-or-treating and she had the BEST time! We had a fun night and stayed way too late. The next day Katie had another fun day with her Daddy! And I got to be by myself for 24 whole hours. More on that later. I need to pace myself! My favorite Arkansan is coming in town this weekend, so laundry and cleaning has to get done. It's no longer just an option! I want my accommodations to be nicer than the Motel 6, and as of right now, they are not. I desperately miss maternity pants during the holidays! Those should be acceptable during the holidays! Katie looked precious and you looked great! What a fun Halloween! You look fantastic! Cute! And you look great! 4 months. Woohoo! You look great! Still so happy for you. I think it's a boy. What a fun Holloween, Katie is darling!